Come join us at ASGBGC (the “Austral San Gabriel Board Games Collective”). Weeknight games start around 7pm and run till 11 or midnight. We play fairly complex, strategic games (as opposed to family games like Monopoly and Uno, or party games like Charades). People who are unfamiliar with these kinds of games are sometimes overwhelmed by the complex rules at first. If you’re uncertain, feel free to come and watch - we love to teach and to introduce new people to this hobby! Teaming with another player can be a great way to get your toes wet. If you want to learn about these sorts of games, lots of good information can be found online. 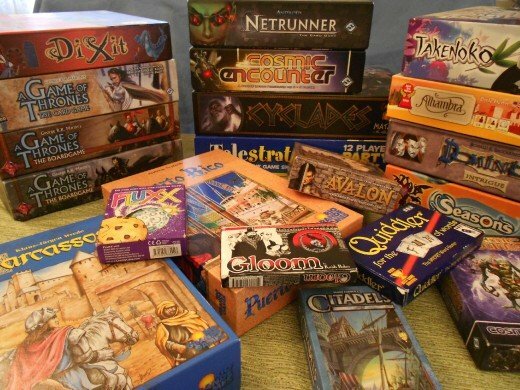 http://boardgamegeek.com is a great resource. Our games range from light casuals like Machi Koro and Carcassonne to heavier contenders like Terra Mystica and Alchemists. Bennett. Cool! We’re looking forward to meeting you and Amanda. Hi strangers, my wife Amanda and I will be attending for the first time. We’re experienced gamers, but don’t have a regular group of friends in the area. Looking forward to meeting you! Marsha, sorry to hear you can’t make it! Unfortunately our regular game nights are pretty consistently on weeknights (last year they were all on wednesdays, this year we’re surveying our membership to see if mondays or thursdays might be an improvement). We’re looking at adding something like a bimonthly weekend daytime event as well, though, so stay tuned. I’m unsure how to cancel but I can’t make it. My kids finally go back to school on Thursday and I gotta get them to sleep at a reasonable hour. Next time (maybe on not a school night?) Have fun you guys! May arrive a little late depending on rain-induced traffic on the 134, but I’ll be there! Thanks for hosting!